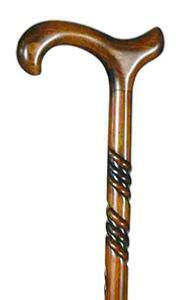 A very popular everyday cane. The spiral carved into the beech wood gives it a distinctive appearance. The derby handle offers excellent support to the hand, and may be hooked over the arm when not in use. Overall height 97cm to suit the taller walking stick user. Fitted with a rubber ferrule.